Get the Lifetime 12 inch spare tire for the Lifetime SAHARA or GREAT BASIN UTILITY/TENT TRAILERS ONLY. Mounts underneath the trailer. 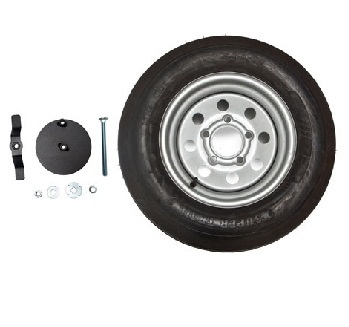 Be prepared with the Lifetime 12" Spare Tire Kit Accessory for the Lifetime Sahara or Great Basin Tent Trailers. Tire mounts underneath the trailer. It has 5 lug nuts on a 4.5 Inch diameter pattern (each side of the axle, so 10 lug nuts altogether). Dimensions: 14" x 10" x 14"